Brief: PRG was approached to aid Greenhills Asset Management in the promotion of the recently renovated Stables development. 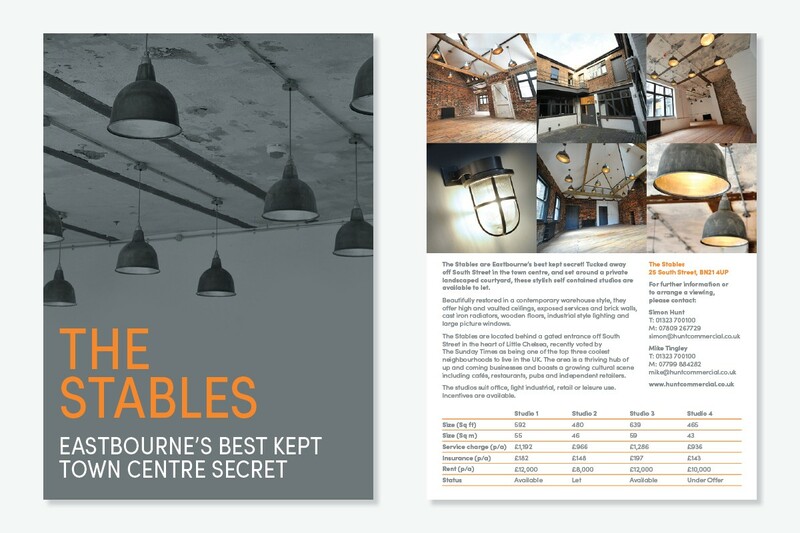 The Stables are located behind a gated entrance off South Street in the heart of Little Chelsea in Eastbourne, an area recently voted by The Sunday Times as being one of the top three coolest neighbourhoods to live in the UK. Solution: PRG worked with Greenhills Asset Management to create an attractive double sided A5 flyer, designed to drive the leasing of The Stables light industrial units. This flyer was dispatched to an established database to pique interest and encourage enquiries. The Little Chelsea quarter, where The Stables units are located, is a thriving hub of up and coming businesses, boasting a growing cultural scene including cafés, restaurants, pubs and independent retailers, an ideal location for a new start-up or a more developed brand to open their doors. As well as applying our honed design skills to create an eye catching flyer, as part of the project we also organised and managed a photoshoot to ensure the images really worked to sell the opportunity. Results: Out of the four units available, there has been interest expressed in two, with further viewings booked. The relationship with Greenhills Asset Management has been very positive and there are plans for a future sales brochure, website and a social media campaign. If your business needs help with either design or promotion, simply contact our experts today.